’We are what we eat & absorb’. Our physical body & our mental-emotional state is a reflection of what’s going on with the ecosystem inside our gut – food has a huge impact on this as it travels through our core. The gut is our main point of contact with the outside world. Obviously, there are many things influencing our health & our mental / emotional state, but food & the way it affects our gut is massive, so don’t underestimate the impact of what you put in your mouth each day! Your food & the state of your gut are major determinants of how happy, energetic, focused, calm & ‘well’ you feel. Aim for the blissful state of ‘gut homeostasis’ to feel great mentally each day! If you’re moody, depressed & / or anxious, but don’t want to head down the pharmaceutical route, try making the following dietary changes ASAP. 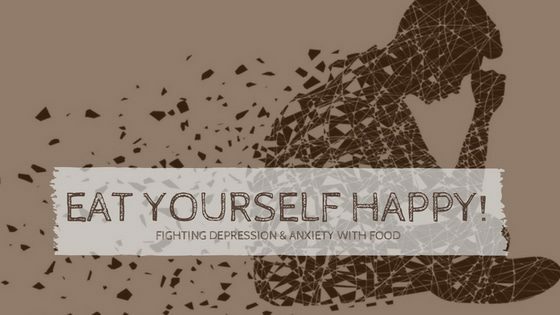 I speak to so many people who’ve seen great results for themselves, friends or family fighting depression or anxiety with food & some simple lifestyle adjustments. Even kids with autism & ADHD can benefit hugely from nutritional & gut health support. Check out this interview with autism expert Rhonda Muller (ASD Healthy Life) who’s made this her life’s work after being forced to find answers to help her son. Poor blood sugar control can aggravate anxiety & depression. Just ask the mum of any 3 year old after a birthday party! Sugar rush = manic behaviour & then the nasty ‘come-down’ & even an afternoon or next day ‘hangover’. We do it to ourselves as adults all the time, it’s just less extreme…& we’re so used to it we think it’s normal to feel that way! A diet to minimise ‘sugar swings’ that destabilise you mentally should be focused on good fats, protein & fibre & be low in refined carbs & sugar. Ask your Dr for a HbA1C blood test to see how you’re tracking – this test gives a picture of what’s been happening with your glucose control over the past few months. High blood sugar fuels inflammatory processes in our body, & depression & anxiety issues will be worse when your body is inflamed. Blood sugar spikes trigger insulin release (quickly gets the sugar into your cells), which leaves you with low blood sugar (triggers cortisol release – the fight or flight stress hormone that wrecks your metabolism & makes you more stressed, anxious, unable to sleep, insulin resistant, & fatter)! You aren’t the only one who craves sugar & carbs – you also have hungry, demanding gut microbes communicating with your brain, asking for the food they love & need to survive (SUGAR). Your microbiome influences your moods (many studies around this) & certain probiotics have been directly linked to improvements in depression & anxiety. One ‘mouse-drowning’ study revealed that mice fed ‘lactobacillus rhamnosis JB1’ kept swimming for longer before giving up & had less stress hormones in their bloodstream than others. In another study, teens eating fermented foods suffered less from social anxiety (10 points for getting teenagers to eat kimchi!). It’s undeniable now that our gut microbes affect our mood, it’s just refining which ones help us to feel calm / stable / happy etc, which ones make us feel worse, then figuring out what they like to eat & what else encourages or discourages their continued residence & reproduction in our guts. So far we know that plant-based fibre is great for the ‘good guys’ & sugar & refined carbs will keep your ‘bad guys’ on top. Exercise is also essential for maintaining a health & happiness-inducing gut microbiome. The main ‘brain essentials’ are protein, good fats & sleep (ok sleep is not a nutrient, but it’s super-important & can definitely be supported with diet)! These 3 WERE considered the main brain requirements, but now we need to add fibre to that list, because of the way it supports our healthy gut microbes & the brain-nurturing substances that they make when breaking it down. Protein is a requirement for maintaining healthy muscles, skin, hair & nails (you’ll feel happier when you’re looking good & getting fewer infections!) as well as for neurotransmitter production. Make sure you get enough from your diet to support your needs. Many experts now recommend fat makes up a large part of your diet if you struggle with mental challenges. Omega-3 fats from oily fish & algae are known to be brain superfoods, & avocados, nuts & seeds are a great source of healthy fat (as well as fibre & polyphenols for your gut bugs & tryptophan to help boost your dopamine). MCT ’s from coconut oil help us burn fats more efficiently whilst following a ketogenic diet (supposedly great for boosting brain function). Gut microbes feast on fibre, & when well-fed help to keep our immune system & our gut-lining working well – they actually manufacture anti-inflammatory substances that work throughout our bodies – including our brain. Recent research reveals that mental health issues like autism, depression & anxiety may be triggered or at least aggravated by inflammation that begins in the gut. Fibre is therefore becoming recognised as an important nutrient to support brain function, mood stability & good behaviour. Drugs & alcohol mess with moods, obvious ones to cut out if you’re suffering mentally. But seemingly harmless foods can also mess you up, you just may not know it! Many people are unaware that their morning cereal could set them up for a day of fatigue & depression, or that their lunch is responsible for their afternoon energy slump. Foods can make your gut & blood brain barriers leakier (increasing systemic inflammation) or may contain chemicals that affect your brain, or feed nasty gut bugs who contribute to leaky gut, inflammation & release toxic substances that end up in your bloodstream & brain. Gluten, dairy, refined carbohydrate products, sugar & sweeteners. Many people who think they don’t react will be very surprised! There are other food groups with ‘brain reactivity’ potential, but these are the most common. See below for some great foods to add to the shopping list to keep you smiling! coffee (polyphenols) be aware of caffeine, choose a natural decaf if you’re sensitive. For some people coffee is definitely not great for their mental health & best avoided, for others it may be fine…listen to your body on this one! cacao powder or dark chocolate – get low sugar, find a quality dark variety, or even better make your own raw cacao treats with BallBags (polyphenols, resistant starch, fibre, protein). Be aware that some may be sensitive to cacao / chocolate. herbs & spices including cloves, turmeric, paprika, cinnamon, star anise, oregano, rosemary. (these contain plant chemicals that can help your gut & / or brain, blood sugar, hormones – a great way to make flavoursome dishes without relying on commercial sweeteners etc). Love to hear your thoughts & tips on this topic so please leave a comment below or send me an email.